There is nothing better than going down memory lane. I was digging into pictures of my university days and I found that I was even more obsessed then in taking photographs. I guess back in those days, I had more time on my hands and was the enthusiastic observer and not the actual vet in action. This meant I got to enjoy every case, document it with snap shots and learn from it but was spared the emotional burden of being directly responsible for it. 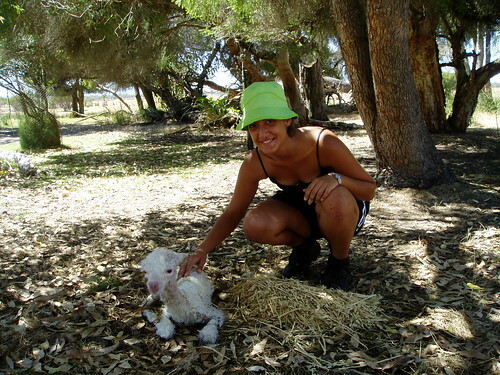 During our veterinary studies, we had to complete several weeks of farm experiences that I absolutely enjoyed. I decided to undertake one of my practical weeks at an alpaca stud and it was a very joyous experience. The owner of the stud was very passionate about her work and so her enthusiasm was contagious. 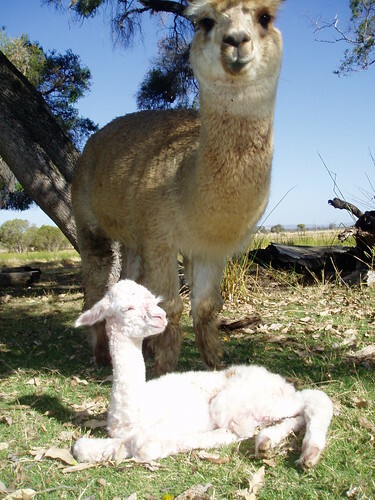 We got to be involved with all aspects of the stud, from observing & intervening ( if necessary) with breeding, feeding all the alpacas on the property, treating any alpacas requiring medication, watching cria (baby alpacas) births or even dystocias (birth difficulties) and so forth. We also got to harness train a weanling alpaca. Ironically while I was the shortest vet student there, I got partnered with the tallest alpaca. I still recall how cheeky my alpaca was to train. He was stubborn and a good kicker too if I might add. Below is the picture of each student posing with his/her alpaca pupil (I’m wearing the green hat just in case you did not recognize me). 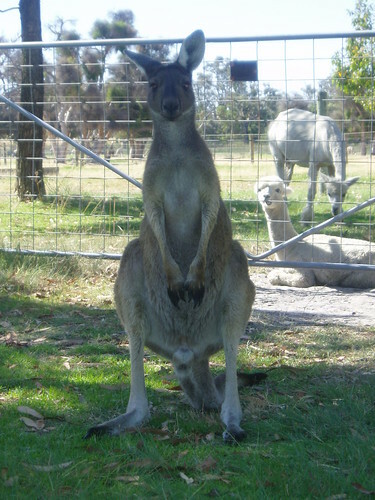 The owner was obviously smitten with all kinds of animals and so we also mingled with her pet kangaroos, dogs and donkeys. The highlight of our week was observing two alpaca births. It was amazing to see how all the alpacas clustered around the alpaca that was giving birth and they all approached the newborn and sniffed it afterwards. 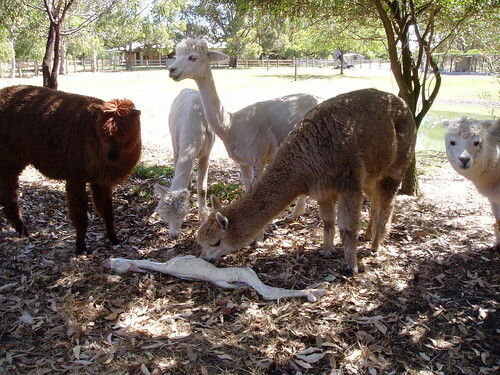 The owner could tell there was an impending birth whenever she saw all the alpacas forming a family gathering. The first one went on naturally and did not require any intervention. 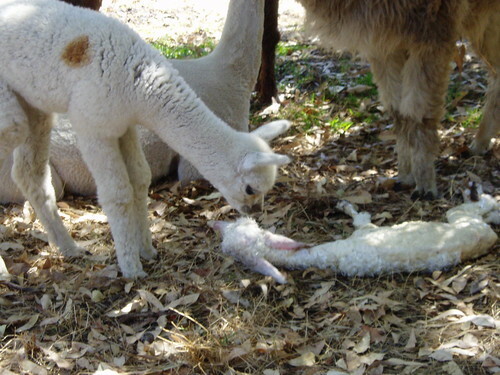 We closely observed the cria (newborn alpaca) and her mom. 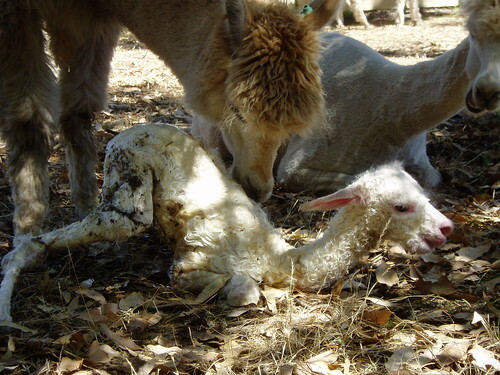 A healthy cria is meant to be active almost immediately, sit up in the kush position within 5-10 minutes, be attempting to stand within 30 minutes and standing within 2-3 hours. 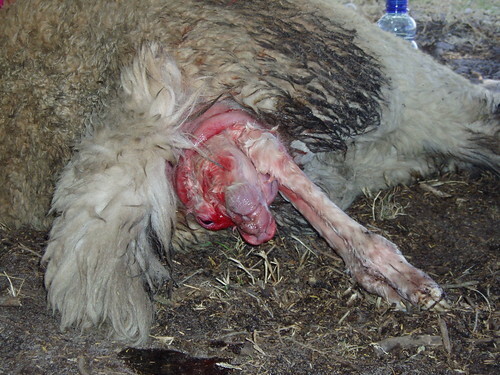 So this alpaca was obviously straining and we could already see a cria engaged in the pelvic canal and ready to come out. The cria should be out within 30 minutes from this moment. The cria is coming out nice and steadily. Cria is safely on the ground.. The rest of the herd approach & sniff the newborn cria. 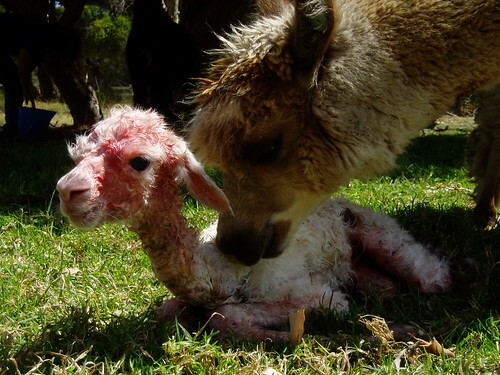 Mom bonds with her cria (this is crucial)! 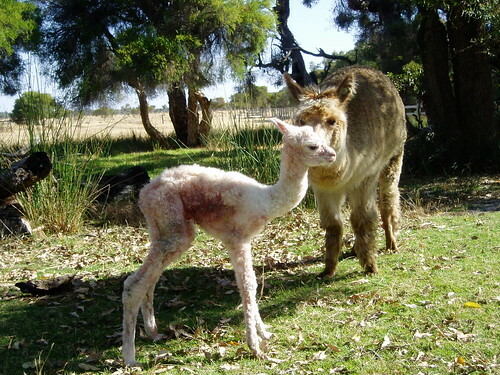 Even a young member of the herd approaches & sniffs the newborn cria. 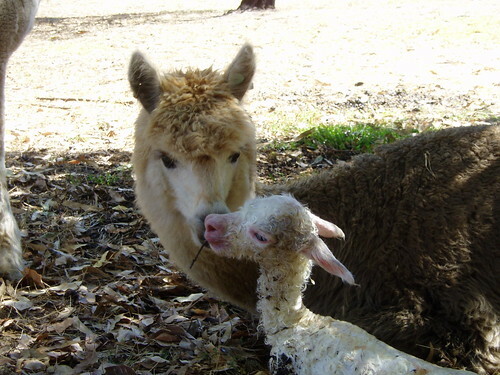 Cria is enjoying tender motherly sniffs. Cria is trying to take first steps. This is not a natural part of the whole birthing but I had to pose with the adorable newborn! 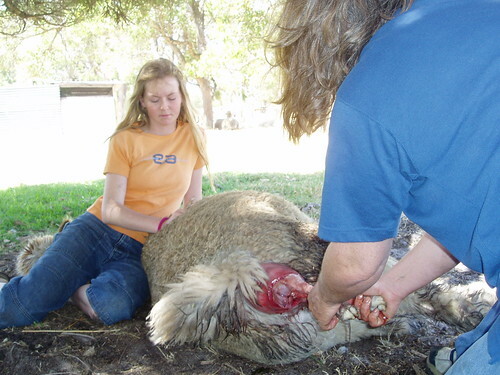 The second alpaca birthing was a dystocia (alpaca was having difficulty) and so the owner intervened. The poor alpaca had been straining for some time and nothing was happening. We could see something was engaged in the pelvic canal but it did not progress. 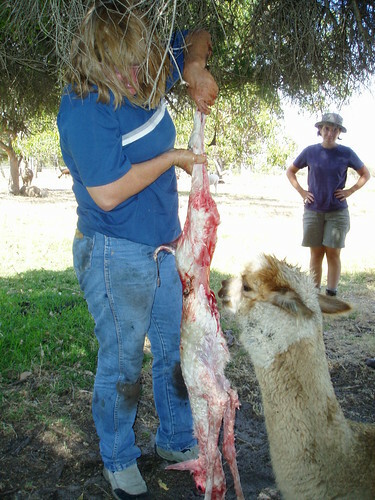 Positioning the cria correctly is crucial prior to pulling and that is what the owner is attempting to do here. 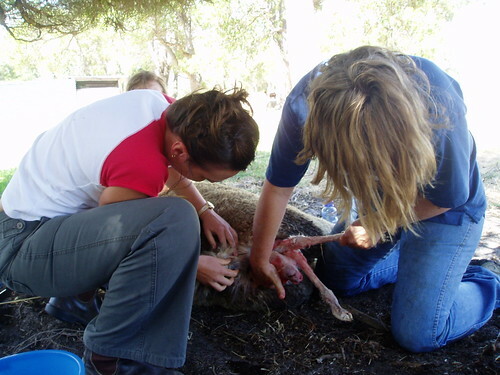 Once the cria is positioned, the owner starts to gently pull and gets one of the vet students involved. I was busy taking pictures. 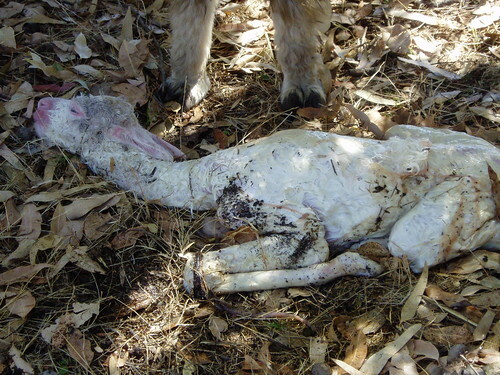 This cria is obviously starting to turn blue (poor oxygenation) because its airway is compromised. 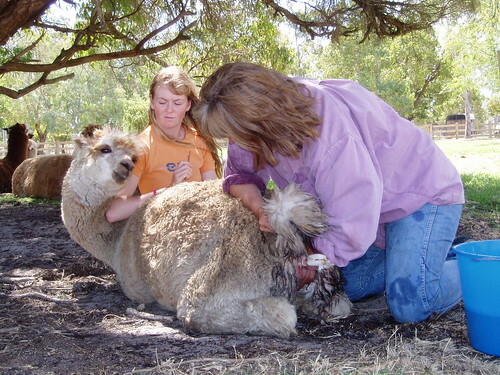 They have to act quick but still be gentle when pulling the cria out to ensure it survives & to avoid injuring the mom. Gently and firmly pulling on the cria. 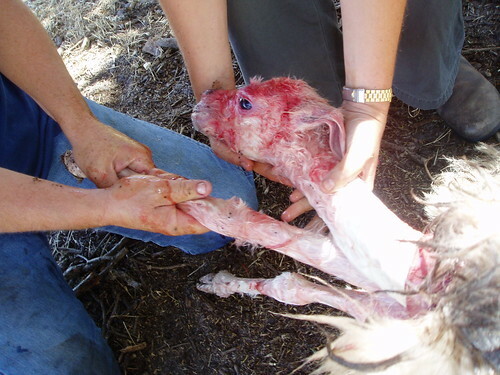 Cria is safely pulled out & owner is holding it upside down to get rid of the fluid that has built up in its chest. 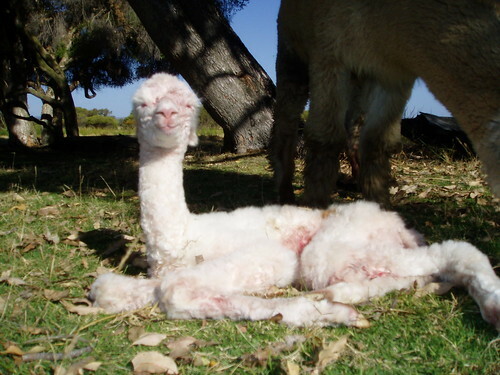 Mom bonding with her cria. The ritual: rest of the herd approaching to sniff & greet the new arrival. Mom with her pride and joy enjoying the sun. Cria contemplating about its future. Cria content with life inspite of its hard start! 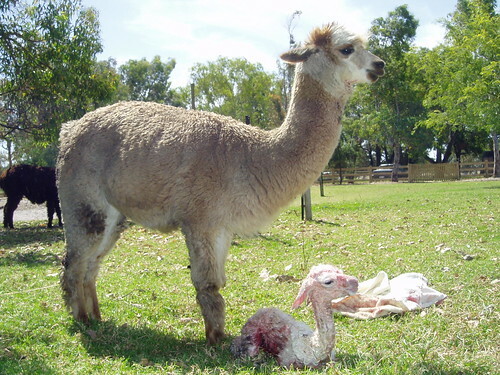 Cria taking its first steps & making mom proud. 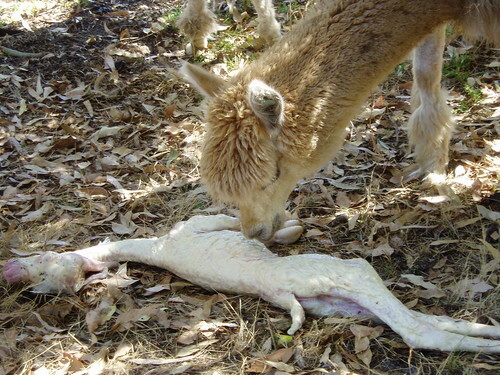 I have really been fortunate to have witnessed the natural & challenging births of two alpacas. 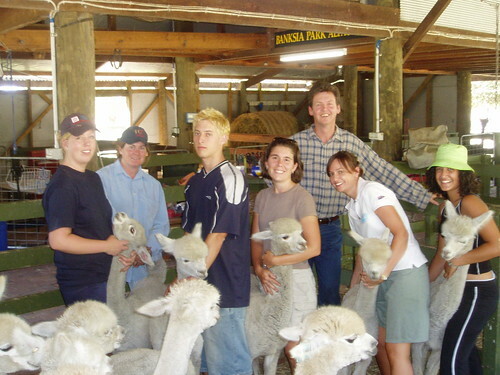 These alpacas were so well looked after and were fortunate to have very dedicated and loving owners. These are the standard of care I expect from most farmers. 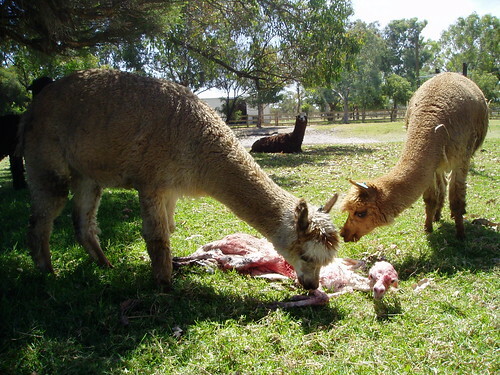 If you intend to breed alpacas, you need to be well set up and prepared to do everything that is required! I’m going to learn a lot reading your blogs. Love it. Also think your decorated car is very cool. I enjoyed you taking us through those two alpaca births, it was really interesting and the photos are great! btw – I love your brightly decorated car too! Thanks barb:) those Alpacas were so friendly to humans, dogs, roos, everyone.. And, they really look after one another its great to share it with you! Hi Rayya, its Sophie Jackson, not sure if you remember me but I remember you! 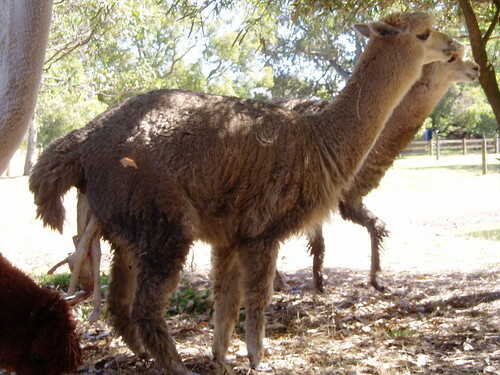 I manage Banksia Park Alpaca Stud and have done so now for the last 7 years. 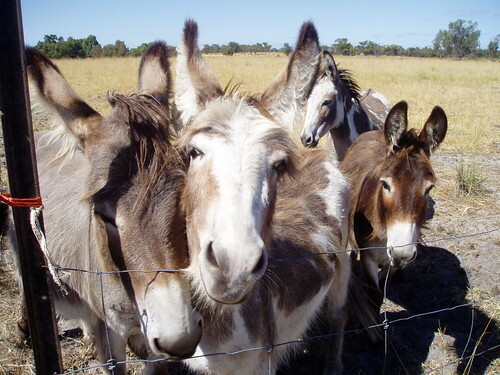 I’ve recently started up my own business selling alpaca products and I’m trying to come up with a logo design so I googled “alpaca stud logos” and a picture of my donkeys came up which lead me to this page. Funny the things you find! Thank you for your lovely comments about our standard of care. Anyway your site looks great and your photos are very informative! Hello Sophie. Of course I remember you. I obviously thoroughly enjoyed my stay at the alpaca stud you were managing. I’m glad you got to read and enjoy my blog. Good luck with your new business.